Starting on Black Friday, November 28th, 2014, through Cyber Monday, December 1, 2014, Eurocom, will offer a 15% discount to customers who order the EUROCOM M3, X3 and X5 fully upgradeable, high performance laptops. “From all of us at Eurocom we are happy to offer our loyal customers 15% off the EUROCOM M3, X3 and X5 from Black Friday to Cyber Monday!” Mark Bialic, Eurocom President. Get yourself a fully upgradeable, high performance laptop at a great deal with the Eurocom Super Black Friday Special! “Each year more customers get excited about Black Friday and Cyber Monday deals and now Eurocom has joined the party," says Mark Bialic, Eurocom President. 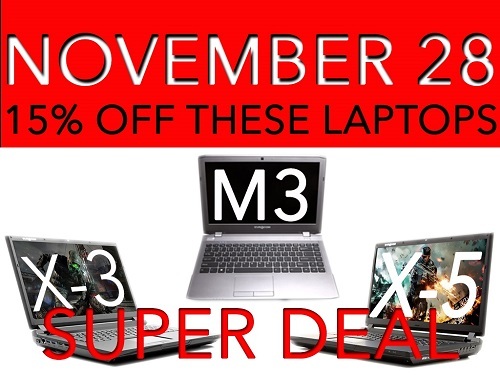 "From the M3 to the X3 and onto the X5, this year we cannot wait to start sending our these amazing laptops to our loyal customers all over the world at great discounts." Power users can easily attain the M3, X3 or X5 for their studies and beyond thanks to the sweet deals at Eurocom during Black Friday and Cyber Monday. Eurocom has been operating in North America for over thirty years, assisting some of the most advanced professionals in their fields with their mobile computing needs along with gamers looking for the most powerful systems on earth to business professionals looking for something practical. This experience has helped us develop some of the most innovative Notebooks, Laptops, Mobile Workstations and Mobile Servers on Earth. Weighing just two kilograms and being an 1.2 inches thin makes the 13.3” EUROCOM M3 extremely portable, with no need for a power cord due to 5 hours of battery life. The M3 is equipped with a beautiful 13.3” full HD 1920x1080 IPS display to take advantage of the pixel processing power of the NVIDIA GeForce GTX 765M and an Intel Core i7 Processor. The custom built 15.6” EUROCOM X3 allows customers to build the exact system they desire. Performance is unmatched with 4th Generation Intel Core i7 Extreme processors, NVIDIA GeForce GTX 980M graphics. Having the ability to add up to 32 GB memory ensures nothing will slow this gaming beast down. To store the latest games and software the X3 supports up to 5 storage drives, with 2 mSATA solid state drives waiting for fast boot up times and blazing responsiveness. Eurocom developed the X5 to be an elegant and prestigious system, for customers to dream of one day owning such a high performance system they can enjoy for many years. The EUROCOM X5 is a perfect example of the flexibility Eurocom laptops offer. The EUROCOM X5 can be customized for engineering, game and application developer, or architecture students alike, the 17.3 inch full HD screen (1920x1080) screen, combined with an NVIDIA Quadro or GeForce graphics processor makes it unnecessary for an external display. The impressive i7-4940MX processor and up to 32GB of RAM push the system to unparalleled speeds. To store your latest applications, projects and software the EUROCOM X5 can support up to 5 storage drives, with 2 mSATA solid state drives for fast boot up times and blazing responsiveness. Please use code EUROCOM-BFCM-MX3X5-141201 when placing you order, just enter the code into "Configuration Instructions" box and we will deduct 15% before processing your payment.